Jasmine Thomas pushes past the defense to the basket. Chris Poss photo. Uncasville, Conn. – With playoff seeding on the line and the Los Angeles Sparks erasing a 19-point deficit late in the fourth quarter, the Connecticut Sun looked like they could be done. But Jasmine Thomas would not let them lose. 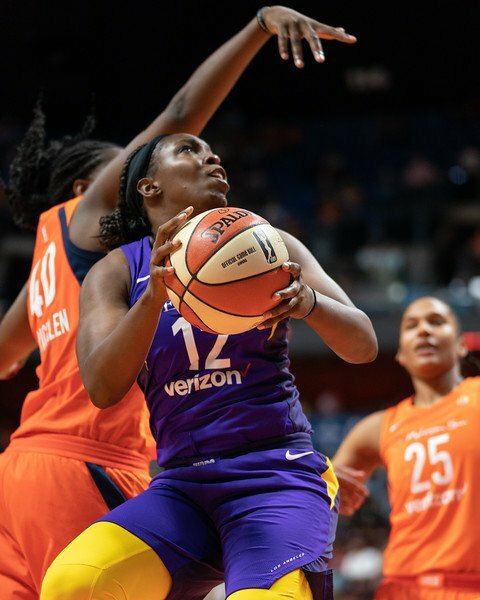 She capped a 27-point performance with three free throws to preserve a crucial 89-86 win over the Sparks, which helped Connecticut clinch a fourth-place seed and earned them a bye into the second round of playoff action. “I did not want to lose. I just put it out of my mind as a possibility,” Thomas said. The veteran point guard stepped up repeatedly to keep her team in the lead, and dominated the game on 7-11 shooting to help hold off the fourth quarter attack by Los Angeles. Jonquel Jones added 17 points, nine boards and seven assists for the Sun. Candace Parker had 20 points and 10 rebounds for the Sparks, including a fall-away three in the final seconds that cut the lead to just two points. Jantel Lavender added 17 points, and Essence Carson and Odyssey Sims combined for 25 points off the bench. A playoff atmosphere suffused Mohegan Sun Arena for the last game of the regular season, and both teams brought the same intensity to the court. The game opened with Los Angeles shooting poorly, but they actually led 14-12 at the 3:50 mark by turning the Sun over and scoring second-chance points. The Sparks misses included a 12-foot air-ball from Parker – something which has probably happened less than a handful of times in her career. Late in the quarter, Connecticut opened up some space with threes by Thomas and Morgan Tuck. They also forced five Sparks turnovers in the last four minutes, and led 26-18 at the break. Early in the second quarter, Los Angeles missed another series of shots, and the Sun were able to run off the misses and score to stretch the lead to 34-20. Jones re-entered the game and scored on three consecutive possessions, with Lavender unable to control her. Connecticut led by 18 a third of the way through the second period. The Sparks finally ended 20-4 run on a Carson bucket in the paint and a four-point play by Lavender. Consecutive buckets by Parker inside closed the gap to just 10 late in the half, forcing Miller to call a time out. Several exchanges of baskets closed out the half with Connecticut leading by 11, 52-41. The hosts shot 57.6 percent at the half, including 8-10 from three, but led by just 11 points. Los Angeles shot just 36 percent, but attempted eight more shots for the half by forcing four more turnovers, grabbing four more offensive rebounds and hitting five more free throws than the Sun. For the game, the Sparks had 20 second-chance points, while Connecticut had just three. The Sun opened the second half on an four minute 11-2 run to lead 62-43 on threes by Jones, Thomas (on a great feed, one of Jones’ seven assists) and Shekina Stricklen, around a driving layup by Thomas past Parker. Chelsea Gray looks for her shot. Chris Poss photo. Sims and Carson entered the game and exploded for a 14-7 run in which the two scored all of the Sparks’ points. Chelsea Gray’s three with 3.8 seconds on the clock, closed the quarter with Connecticut’s lead cut to just six, 69-63. Parker returned to start the fourth quarter. The Sun immediately turned the ball over for the 14th time, Sims drove for another basket, and the lead was just four. Connecticut seemed completely out of sync, and Miller called another timeout after just two minutes. The Sun responded to the smaller Los Angeles lineup by turning to their guards, as well. A reverse layup by Courtney Williams around Parker, two buckets by Morgan Tuck, and another Williams jumper extended the lead back to ten with 4:50 left in the game. The teams exchanged misses and makes for the next few minutes, and Connecticut appeared to have the game in hand with a ten point lead under two minutes. The Sparks would not go away. Led by their guards, and aided by Sun turnovers and missed free throws, they cut the lead to three points several times, and then to two on Parker’s late, off-balance three. Two Thomas’ free throws extended the Connecticut lead to four, but two free throws by Riquana Williams cut the margin once more to two points, with 1.2 seconds left. Miller called a timeout to advance the ball. The game ended on a strange coaching error. Before the inbound, Los Angeles coach Brian Agler told Parker to step off the court toward the in-bounder. This is a long-used coaching move to discover the in-bounds play at the cost only of a delay-or-game warning. The move backfired, however, as Agler had apparently forgotten that the WNBA added a rule last winter to deter exactly that coaching tactic. Parker was called for a technical foul under the new rule. Thomas made the free throw, and the Sun successfully got the ball in play, taking the last 1.2 seconds off the clock, escaping with a harrowing win, securing their second straight No. 4 seed, and their second straight 21-13 season. Miller acknowledged that the win was huge for his team. Agler said his squad, which locked up the sixth seed at the end of the day, was not deterred in losing. Despite the disappointment, Parker was encouraged by her team’s comeback. The Sparks face No. 7 Minnesota Tuesday, in a rematch of the Finals of the previous two years. Connecticut closed the season winning 9 of 10, and tied Seattle for the best home record this season at 13-4. 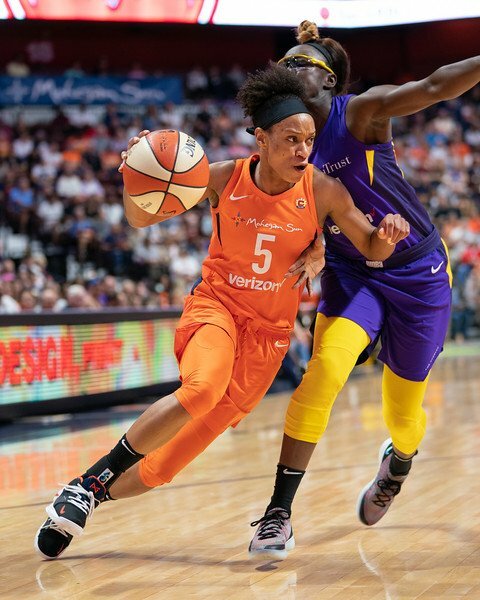 The Sun had fallen to .500 in mid-season with Alyssa Thomas injured, and high tension in the locker room that forced the Sun to trade Alex Bentley. But the return of Thomas lifted them. For Miller, this season has been one long rewind, which his team intends to play out in a new way this playoff season. In exactly this position last year, the Sun lost at home to Phoenix. The Sun will play at home Thursday against the highest remaining seed after Tuesday’s first round playoffs.